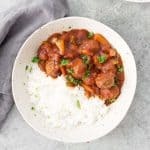 Slow Cooker Sweet and Spicy Meatballs! These meatballs are packed in a sweet and spicy pepper and pineapple sauce. So delicious and perfect for weeknight dinners! Throw everything in a slow cooker and dinner is ready when you are! Place crockpot on high setting. Add 1 tbsp. olive oil and chopped onion. Stir and let cook until onion is slightly cooked, about 10 minutes. Add bell and jalapeno peppers, stir into the onion mixture and let sit for another 5 minutes. in a separate bowl, combine the cornstarch, maple syrup, pineapple juice, tomato sauce, all spice, ginger, garlic powder and liquid smoke (if using). Stir together until blended and pour onto the pepper mixture. Stir in the frozen meatballs and diced pineapple. Cover and let cook on high for 2-3 hours or on low for 5-6 hours. Sauce should be reduced and thick, meatballs heated all the way through. I used frozen meatballs here but if you want to make your own, I love my mushroom meatball recipe!